Many people would say that the best goalie in the world hands down is Carey Price. One of Carey’s many strengths is the language he uses. Why should you as a goalie be concerned with the language you use? Because when you talk, your brain forms pictures in your head. For example if I say the word “goalie”, you picture an actual goalie in your head and not the letters “ g, o, a, l, i, e, ”. This is how your brain thinks. In pictures. Why should you be concerned with the pictures in your head? Because “you will walk into the picture you hold of yourself”. Why are athletes told to visualize before a game? Because of the rule that you will walk into the picture you hold of yourself. If the above is true, then you need to consistently fill your head with great pictures. This is impossible to do if you are using language that puts negative pictures in your head. Here are a couple examples for you to test out right now. Say “I let in a goal”. What do you picture when you say “I let in a goal”? I don’t know about you, but I picture stepping to the side of the net and letting a puck go in the net. That is not a positive picture, is it? Now say “I got scored on”. What do you picture when you say “I got scored on”? I picture a puck blowing past me as ‘I get scored on’. That is not a positive picture either, is it? Therefore, after you play a game, if you say. “I let in 3 goals” or “I got scored on 3 times” or “they scored on me 3 times”. You are forming negative pictures in your head and negative pictures lead to negative results. The other important factor here is that your brain does not recognize the word “don’t”. For example, if I say “Don’t think of getting scored on”. “don’t think of getting scored on”. What do you picture? Getting scored on, of course. Even though I said “don’t think of it”. Your brain doesn’t recognize the word don’t and you still end up picturing getting scored on. If you have a game and it is not perfect. Meaning, you don’t get a shutout, I want you to replace “got scored on” or “let in a goal” with the following. “Didn’t come up with the save” or “Didn’t stop the puck”. You see, when you say the latter two your brain still pictures coming up with the save or stopping the puck. It is a much more positive picture for you and remember from the first article. “You will walk into the picture you hold of yourself”. I want you to test this out. Next practice, experiment with a positive picture in your head and a negative picture in your head. Do the negative picture first. When the players are skating toward you and getting ready to shoot, say to yourself “Don’t get scored on, don’t get scored on” over and over. When you say that, you picture getting scored on and you will notice it makes it a lot harder to stop the puck. Therefore, when you are reviewing or talking about saves you didn’t come up with, say exactly that. Never say “I got scored on” or “They scored on me”. When you say that, your mind will picture exactly that. Never say “I let in a goal”. If you do, your mind will picture you letting in a goal. Also, never say “I let them score”. Would you actually “let” someone score?” I don’t think so. Erase those sayings from your vocabulary. Now back to Carey Price and the strength of his language. He was getting interviewed by the press after Montreal lost a big playoff game. You could tell in the interview that Carey wasn’t too happy and reporters do not always ask the best most empowering questions to athletes. In describing the last moments of the game that Montreal lost Carey said “I didn’t come up with the save at the end of the game”. Think about what he said for a moment. ‘I didn’t come up with the save’. He didn’t say “they scored on me” he didn’t say “I let in a goal”. Remember when we talk, we and people we are talking to create pictures in ours and their mind. When I say to you “come up with the save” or “don’t come up with the save” your mind will picture you making a save. Remember, your brain doesn’t recognize the word “DON’T”. As the interview carried on with Carey price and he had, had enough of the reporters and was leaving the interview, one last reporter yelled out “Carey, do you think you could have stopped that last puck? Carey looked back as he was leaving the interview and said “I feel like I can stop every puck”. Let that percolate in your mind. “I feel like I can stop every puck”. The language Carey Price uses is one of the reasons he is the best goalie in the world. Here is a simple list of what not to say and what to replace it with. 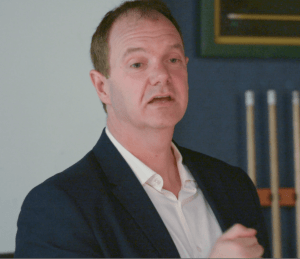 Goalie Mindset Coach For The Pro’s, Pete Fry is the Author of Goalie Mindset Power, the Complete 30 day program for goalies. He is also the Author of the book Goalie Mindset Secrets - which he is giving away free to our readers. Just follow this link to get your copy today. 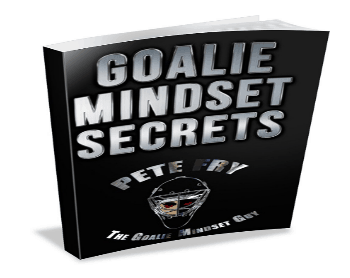 Get your copy of Pete's book Goalie Mindset Secrets for free today.